Urban Neighbors: The Biodiversity of Urban Los Angeles: Watch Online! This event was a part of the Civic Engagement Survival Guide: a series of free talks and workshops focused on creating a community that is informed, organized, and engaged. Samantha Sullivan is a graduate student in pursuit of a Masters in Biology with an emphasis in wildlife conservation. Currently, she works with communities both locally and internationally on assessing barriers and collaborating with locals and conservation organizations in the region to create solutions that work toward coexistence between wildlife and the community. 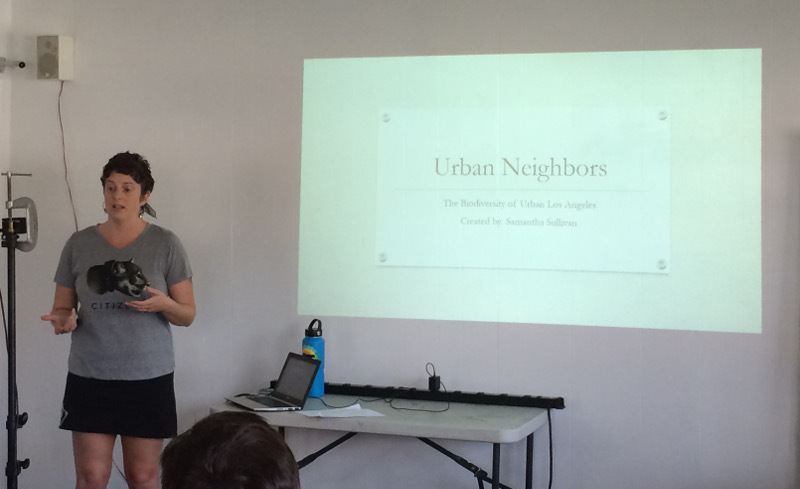 Recently, Samantha came to speak at CRASH Space to educate our community about how we can protect our local wildlife. You can learn more about Samantha through her website, www.openspacescoalition.com. Watch past videos or view upcoming events on the Civic Engagement Survival Guide. CRASH Space is a 501(c)3 non-profit organization which works to promote education through individual projects and social collaboration. CRASH Space is also a member of the EFF Electronic Frontier Alliance: a grassroots network of community and campus organizations across the United States working to educate our neighbors about the importance of digital rights. Leading an event in this series is a paid opportunity. We are interested in events which encourage community action and education, on topics such as: civic engagement, social justice, support for marginalized groups, environmental protection, and more. Please send proposals to [info at crashspace dot org]. To support our work, you can donate here.